McDonnell-Douglas MD-83 F-GHHO (c/n 49985/1838) is seen here on finals into London-Heathrow on August 22nd, 2000. 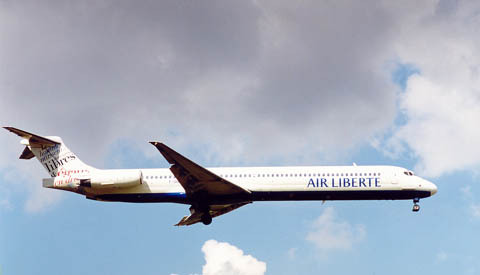 Air Liberté was part of the Groupe AOM which had to file for bankruptcy on June 15th, 2001. It started as purely a passenger charter operator but commenced scheduled flights in 1991. During the 1990s various other operators tried to take over Air Liberté: British Airways, Virgin and Royal Air Maroc to name a few. But Swissair (SAirGroupe) was the one to succeed in 2000. Unfortunately most partners in the SAirGroupe made losses instead of profits, incl Swissair. The end came in 2001, but together with AOM a restart was made that same year as "Air Lib". Air Liberté leased this MD-82 (converted MD-81) ZS-OBF (c/n 48019/1001) from South African Safair and was photographed at Amsterdam-Schiphol in June 2000. At the time of bankruptcy, Air Liberté operated a fleet of ATR-42s (3), ATR-72 (3), Fokker F.28s (3), Fokker 100s (9), MD-82/83s (15) and DC-10s (3).